The listing process is extremely simple! Start creating your personal account, then fill in the selling form and provide us with all the product details (price, brand, description, materials, measurements etc. ), the more information you share, the more likely you are to have a successful sale without a return! Remember to upload at least 4 pictures, they must capture all the relevant angles and show any existing damage on the item. After the submission Deesup’s team will start reviewing your product and provide you with a response (approval/rejection). If the item is accepted it will be listed on Deesup’s shop and made available for sale, in this case you will also get a listing confirmation. After the purchase is completed Deesup keeps the 20% of the selling price for the products submitted till October 31st 2018, while for all the products submitted as from November 1st 2018 the fee is updated to 25% of the selling price. Further details are available on the Terms & Condition page. Listing your product is easy and free! Get started here. The more pictures are provided, the more successful the sale will be! Feel free to upload as many pictures as you have. IMPORTANT! 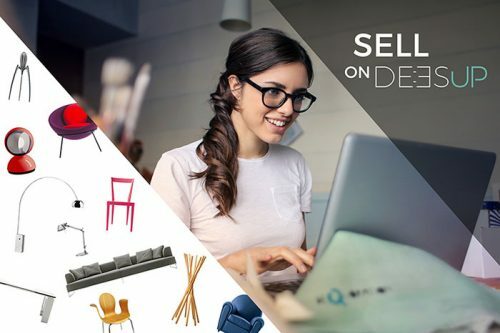 If the item is composed of more than one piece, such as a set of chairs, an additional picture that shows the set all together is required. Take a picture in a bright place or use day light (but avoid direct sunlight), poor lighting might downplay your products! Deesup will take care of editing the cover picture taking the best among the ones you provide. The others will be slightly edited as needed. The seller is responsible for preparing the item for the shipping, he/she needs to take all the necessary actions to pack the product according to the size and weight. The packaging must be done in order to prevent any damage during the shipping. Deesup cannot be considered responsible for any damage occurred during the transportation and due to a bad or insufficient packaging. Use quality material, rigid and in good conditions, boxes and cartons should be preferred to any other options. The box ox must be made of strong and rigid paper, ideally brand new. The size of the box must be appropriate to ship the item, if it’s too empty it might be subject to damage, and if it’s too full it might break. Make sure the box has a free side to stick the shipping document. Pluriball: it is flexible and it allows you to cover any products of any shapes. Before you start the packaging check if the product can be disassembled, for instance many tables are composed of a set of pieces. In this case disassemble the product and cover each piece with pluriball and scotch tape; if possible use a rigid box to pack. If the product is just one piece and has a large and irregular size you need to wrap it with carton paper, cut in multiple pieces, then cover everything with plastic paper. Use scotch tape to fix everything. Make sure any irregular points are well covered to prevent any type of damage during transportation, add extra protections if needed. If the product exceeds 50KG, it is mandatory to set-up a pallet: you need to get a wood base (maximum size allowed 120X120 cm.) and lay down your item building a stable pack. The item size cannot exceed the base size, a maximum of 180 cm. in heigh is allowed. IMPORTANT! In case the packaging is not considered suitable for a safe shipping, the courier is entitled to refuse the product collection and not proceed with the shipping. This is the case when the packaging is not considered appropriate and the handling is not possible. earn quickly get 80% of the selling price.